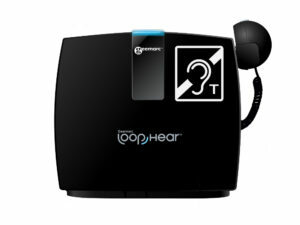 Portable induction loops are units designed for easy communication between a speaker and people that wear T- coil hearing aids. In many public situations, induction loops are often vital to ensure that hearing aid wearers can hear what you are saying. Ideal for one to one applications such as at service counters, railway stations, banks, in vehicles or at small meetings etc. Increasing access to your service for people with hearing loss can be good for your business.